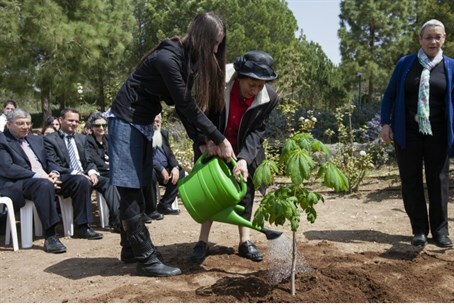 Sapling grown from chestnut tree Holocaust victim Frank wrote about in her famous diary will be planted this month. A sapling grown from the tree that Holocaust victim Anne Frank wrote about while in hiding will be planted this month on the US Capitol grounds, congressional leaders announced Tuesday. "The Anne Frank memorial tree is an offspring of the horse chestnut tree that was featured in Anne's diary writings," House Speaker John Boehner and Senate Majority Leader Harry Reid wrote in a letter to members of Congress. The tree "grew outside of the Amsterdam building where she and her family hid from the Nazis during World War II," they explained. The planting on the Capitol's west front lawn will occur during a ceremony April 30. The young tree is among several saplings created from the original tree, which collapsed outside the Amsterdam annex in 2010. She was captured August 4, 1944, and died seven months later at age 15 at the Bergen-Belsen concentration camp. Her diary was rescued by a family friend, and through the help of Anne's father Otto Frank was published and eventually translated into more than 60 languages, including in English as "The Diary of a Young Girl." In Japan this February, a series of vandalism attacks at Tokyo libraries targeted Frank's diary, with roughly 300 copies of the diary and related books being torn or defaced. In March, a 36-year-old unemployed Tokyo man was arrested in relation to the vandalism. Japanese Prime Minister Shinzo Abe visited the Anne Frank Museum in Amsterdam shortly thereafter, calling the vandalism "regrettable," and noting "we would like to face historical facts in a humble manner and we would like also to pass on the lessons and facts of history to the next generation." After the vandalism, the Israeli embassy donated 300 copies of the diary to local libraries, and the Anne Frank Museum donated 3,400 copies of its catalogue. Many local Japanese citizens donated copies of the diary to the affected Tokyo libraries following the attack as well.